The king of the jungle? Lion? Tiger? No. It’s the toucan. Join old yellow beak to play 3D slots jungle themed kooky 5 reel designed to wet your taste buds with luscious fruit symbols and free spin bonuses in this tropical paradise. This is a really fun and lively casino slot online game from the crew at Nextgen gaming and one which really enjoyed. 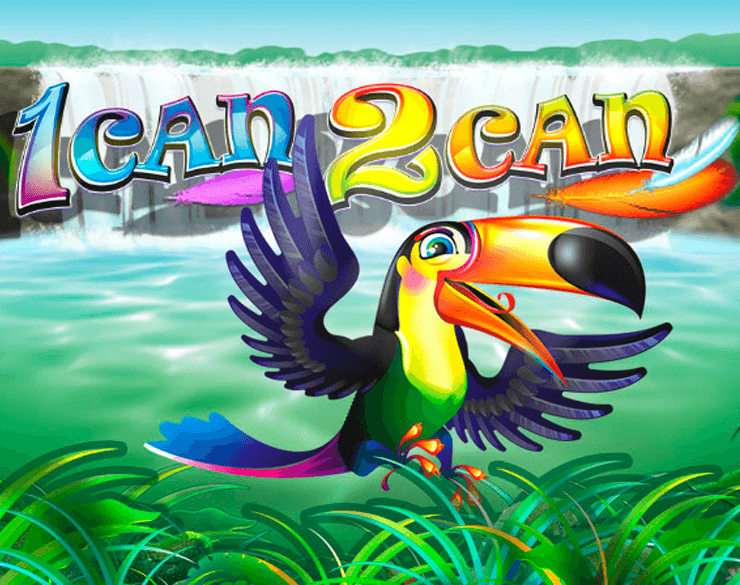 With a tropical jungle theme, the brand of the game is actually a pun on the name of the famous jungle inhabitant the Toucan – hence the 1 Can 2 Can naming. 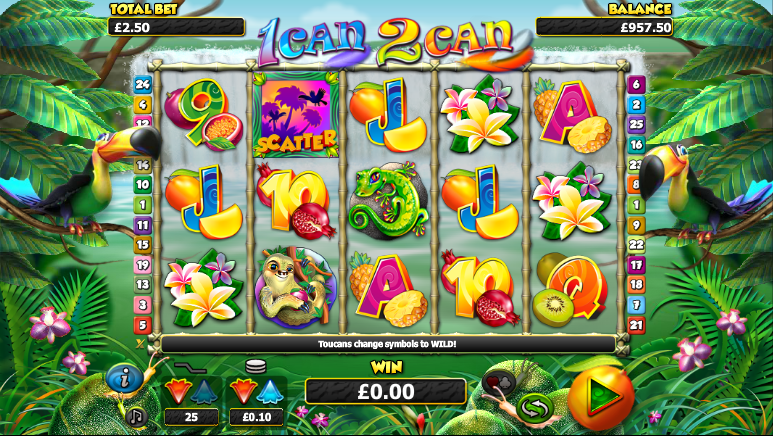 That exotic jungle location forms the entire theme for the slot game with its bright vivid colours and out-there looks, it really captures the attention of players, it certainly did us. Have a try, but before you do, read up the information below so you can get a sense of what the game is about before you have a play. Nextgen is a very famous developer with a significant and illustrious pedigree in bringing some really fantastic slots games to the market. We like their games as they always blend the right degree of gameplay, functionality and design ethos. Their online slots games tend to have nice graphics and a decent theme that’s well executed, and 1 Can 2 Can is no different in that regards. We like the layout and the superb bonus features and think you will too. 1 Can 2 Can is a 5 reel with 3 main rows and 25 paylines, like many games these days. That tropical setting is the perfect place for an adventure like no other and you will get the chance to land some exotic Jackpots also! There a huge opportunity to see a win of up to 1000 times your initial bet, so if you are willing to go ape and bet large, you might see a correspondingly large jackpot! 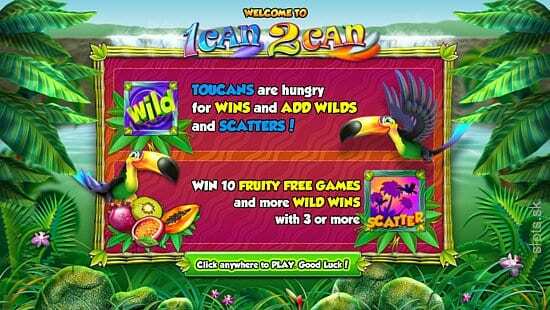 Those Toucans are the main attraction of the game – and the jungle, and they have some exciting bonus adventures lined up for the intrepid slots player. For those on a betting budget, this slots game allows you to bet from just 1 penny, all the way to a very respectable £50 max bet, and everything in between, and we think this adds a great deal of flexibility to those players who want to adjust their bets as they play. We love the graphics on the game, the bright and lively setting and backdrops and of course the beautiful details of the Toucans themselves, all of which add up to a very nicely laid out game that’s high on fun and visual appeal. You could almost be there in the tropical jungle with them! The bonuses are equally exotic, as aside from the normal free spin mini-game, which is activated when you land on 3 or more of the game scatters, kicking off the feature with 10 free spins, the Toucan can also appear on the bonus to give you a hand to stack up more wins. The other big feature is the opportunity to wager your latest win by correctly betting on the suit or colour of a drawn playing card. If you hit lucky and guess right, this bonus could end up with your doubling or even quadrupling your win! So worth a punt maybe from the best spin slots you can play? This is one of those games that’s more to fun to play than it even should be. We liked many aspects of this slots game. We liked the bright colours and engaging gameplay, the attractive graphics and the bonus features, and most of all we love the Toucans! 1 Can 2 Can is one of those games that you just need to try for yourself, and don’t be surprised if you end up loving thig slots game just like us! Squawk!!! If you liked 1 Can 2 Can then you should also try our chilli gold slot.